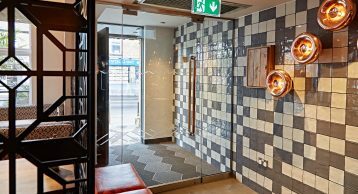 Those wanting their PERi-PERi fix in Stockton Heath can now rest easy as NANDO’s has re-opened following its refurbishment last month. 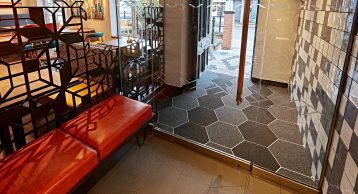 What better way to open the doors to the starving PERi PERi fans than by making a great first impression on them as they enter the restaurant with our innovative INTRAshape Entrance Matting system – the first installation of our brand new product! 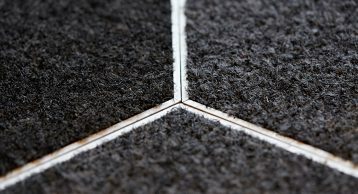 The Hexagon, combined with anthracite and black fibre, was selected by FUSION Design and Architecture to complement the restaurant’s unique interior décor, creating a stunning aesthetic feature that blends with the flooring beyond. In addition to the robust functionality you expect from INTRAmatting, the exceptional aesthetic appeal of the INTRAshape product is unrivalled – with five unique shapes in the INTRAshape range, the possibilities are endless. Paired with the highly versatile and colourful fibre inserts you can be sure no two entrances are alike. 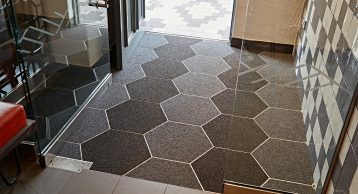 INTRAshape tiles can be used to create striking visual effects to enhance the internal aesthetics of the building and create a sense of movement, rhythm and perspective. 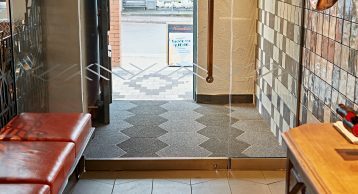 Made with a strong aluminium composite board and 100% recycled Econyl yarn, it is ideal for entrances with multi-directional foot traffic. 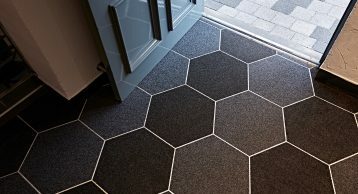 Create your own design using our range of 5 polygonal shapes combined with a mixture of colours. Try our shape selector or request your free sample today. 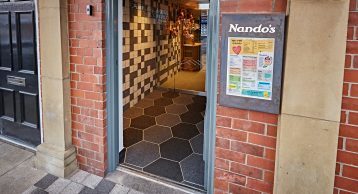 Why not view some of our previous work with Nando’s South Aylesford where we utilised the power of INTRAform DM to create a stunning, high impact chevron pattern.